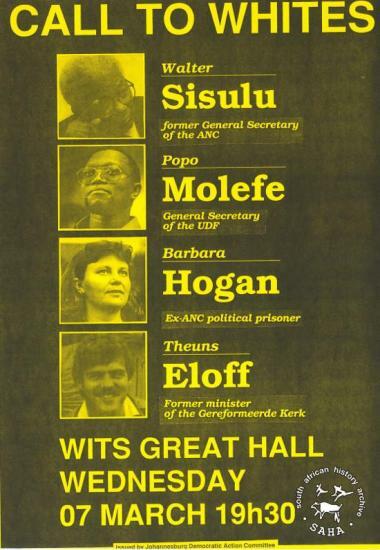 Description: This is an offset litho poster, issued by the Johannesburg Democratic Action Committee (JODAC) in 1990. 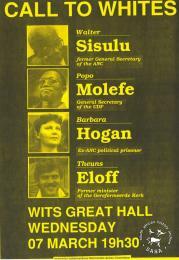 The text reads: "CALL TO WHITES : Sisulu, Molefe, Hogan; WITS GREAT HALL WEDNESDAY 07 MARCH 19H30". This poster was digitised by Specialised Archival Solution in 2009.Included in SAHA online repository on non-racialism 'Tracing the unbreakable thread". Rights: User restrictions may apply. See SAHA copyright statement.